My goal as a teacher (and an artist) is to always hit the bull’s eye on my figurative target and be successful. When I approach a lesson with creativity, there’s a better chance of success. When I make a lesson meaningful and relevant, the students are engaged and, of course, learn more. Before our recent field trip to the San Diego Zoo, we discussed which animals we wanted to see. “The zoo keeper always knows how many different kinds of animals are in the zoo,” I explained. When we arrived at the zoo, I gave each student a small golf pencil and an “Animal Counting” journal. I instructed them to note in their journal each time they saw a different animal. Here’s where it got fun: some students made “x’s”, some made tally marks and others even drew pictures. (Remember, I didn’t tell them specifically how to keep track of the animals.) Each student was excited about their own tracking method. Then, we expanded the journal entries into a counting lesson. Bull’s eye! How can you hit the bull’s eye? Where can you increase student engagement through creativity? It doesn’t have to be a big deal. It can be as simple as having students draw a quick sketch of how they think a character in a book is feeling. Any attempt at change is growth. Each attempt gets you closer to the bull’s eye. Many of these Heart-a-Day drawings have flaws. I was aware when they occurred, but decided to live with them and move on. While I can still see the oops, I think they make each piece unique and original. 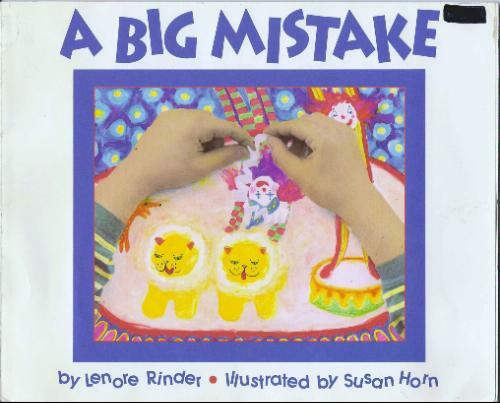 Each year, before I teach my first art lesson, I read to the class “A Big Mistake.” It was written by Lenore Rinder and illustrated by Susan Horn. This story is about a child who makes a mistake while creating a piece of art. They get frustrated, taking it out on their artwork by blotting and splashing paint on it. But then they stop and look at the work and see it’s potential. Finishing it, they become satisfied with the results. I want my class to know that – both as artists and students – when they make a mistake, they can say “oops” and move on. I think this also is very true for teaching. What do you do when you make a mistake? How can you fix or change it? Can you learn from it, let it go and move on? Do you have to hold onto it or can you forgive yourself? How can your mistakes add to your interest and individuality as a teacher? Make the mistake. You’ll be surprised how it improves your teaching. When a teaching technique is working well and going right, I obviously want to keep doing it. It’s sort of like catching a really good wave and body surfing to shore – and then catching another one. Last spring, our class planted sunflowers outside in a large square of dirt. When they grew, the sunflowers would form the walls of a “house.” To enhance this exercise, we counted the days until our seeds sprouted. Then we regularly tallied our sunflowers to see how many were growing. We measured the height of each plant. We read books about sunflowers – including one about Vincent Van Gogh’s sunflower paintings. We painted sunflower pictures, using his style as a guide. Finally, we celebrated by presenting the sunflower blooms to members of the school staff and administration who had been kind to us all year. So many lessons from one exercise – and I can’t wait to do this again! What’s working for you? How can you grow it? Is there a beloved book you can extend into other subject areas? How about creating a story around a math problem, so the problem is more fun to solve? Can you introduce a social studies topic with a drawing lesson? Take a chance. Catch your wave and ride it. It has taken me much soul searching and trial and error to realize that life is not always black or white. As hard as I try to make it that way, there is always gray. But the gray area for me is where creativity begins. When I accept that a lesson I’ve planed to teach is not black or white, I give myself permission to add the creative shades to it. For example, I can begin with a counting song before I start the lesson on addition. Or we can act out a story once we have listened to it. We can go outside and count the sunflowers that are growing in the garden, then draw a picture of them. A week later, we can check to see if there are more flowers. I know the most important thing for me to do is add some small creative touches to make the lesson enjoyable for me and for the students. What can you do to add creativity to a lesson? Can your students draw a picture of how a book or story made them feel? Can your class create a rap, poem, or song to practice math and science concepts? Try something small and see where it takes you. Have fun! On Valentine’s Day 2017, I drew this Pinterest-inspired art in a 4″ x 6″ journal I was given at an art museum. I posted it on Instagram, and to my delight, people liked it. I decided I would draw and post a heart a day for a year. A year later, with four journals, and 365-plus heart drawings, my Heart-a-Day Project is complete. “Heart Work” is phase two of my Heart-a-Day Project. Using the drawings from my Heart-a-Day Project as inspiration, I’ll share what I’ve learned about teaching creatively across the curriculum. My 17 years as a kindergarten teacher has shown me that the heart of a lesson comes from the creativity that can be infused into it. Each day I’ll offer a tip or technique I use to teach creatively. I may repeat myself as I get the hang of this, so please bear with me. All ideas and suggestions may not be original to me. I may also miss a day or two on occasion. Yet, I’ll do my best to persevere and make this fun and interesting. I’m excited to start this journey. Thank you for joining me. The Artist’s Way by Julia Cameron – At some point in our lives we forget that we are creative beings. Through inspiring stories and creative excercises, The Artist Way allowed me to rediscover my inner-artist. Teach Like Your Hair’s On Fire by Rafe Esquith – There are rewards and power in completing a task over time. Teach Like a Pirate by Dave Burgess – Each day, give your students a reason for them to want to be in your classroom. I’ve been successfully teaching kindergarten for the past 17 years at a culturally diverse, socio-economically challenged school in San Diego. In my spare time, I’m also an artist, musician, and author. I recently completed 365 heart drawings in 365 days. My teaching experience has shown me that the heart of a lesson comes from the creativity that can be infused into it. It’s my desire to share what I’ve learned about teaching and making art with you.